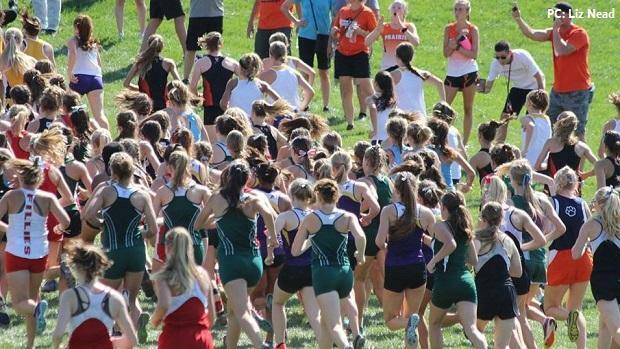 The Heartland Classic is one of the biggest regular season meets in Iowa with schools from all over the upper Midwest competing, flipping from the traditional Iowa State course of recent years back to the Pella course at Central College this year. The course presents a beautiful landscape for spectators with a challenging course for competitors. The hardest part of this year's meet wasn't the footing, or the hills, or the competition, but rather the weather. With a heat index in the upper 90's and direct blazing sunlight, athletes were collapsing left and right and the medical tent was full of competitors of all abilities recovering. Excellent performances still managed to outrun the heat, including this year's 4A star Tim Sindt who clocked 15:30 in the conditions, an entire 26 seconds ahead of the next finisher, Max Manley of Edina (MN). His time was only 3 seconds slower than his fastest 5k time so far this season despite the less than favorable conditions. Sindt has impressed this season, so far going undefeated and easily taking the win each time despite the competition. The next Iowan finisher was Dowling's Will Ode in 16:13 for 7th overall. Edina came home with the team win in 57 points, with Ode leading Dowling to a 2nd place finish with 111 points with their scorers all in the top 50 (their 6th also finished within the top 50). The next Iowa team in the scoring was Dubuque Hempstead in 6th with 226 points. One of the most impressive performances of the day came from Linn-Mar's Micah Poellet who won the race in 18:49- a big season best for the sophomore. Johnston's top runner, Brooke McKee unfortunately had to drop out due to the conditions and was unable to fight for her undefeated streak so far this season. Waukee sophomore standout Peyton Kelderman finished in 19:24- a one second season best- to help the Warriors pull out the second place finish with 101 points. Despite McKee's unfortunate result, the Johnston Dragons still came home with the win with 94 points. Sophomore Aleah Tenpas stepped up for the team running 19:51 for 10th place to lead the Dragons. In recent Johnston fashion, their next 3 finishers packed up and finished strong together - Bella Heikes in 17th (20:17), Clara Toot in 18th (20:19), and Faith Nead in 19th (20:22). Their scoring was rounded out by Samantha Strauss in 30th (20:41). Johnston's returning individual XC Champion from 2017, Paige Horner still has yet to make an appearance, though she has been confirmed competing in the triathlon circuit, most recently in Australia, and clocking 5k's under the 19 minute mark. During the 2017 season she did not debut in a cross country race until October and could very well do so again this year. Should that be the case, the Dragons will certainly be the favorite to take the win, and possibly to dethrone their own record setting score from 2016. In the end, the heat certainly impacted the results of the race, but many were able to push through and present some great results despite. With less than favorable conditions for most of the season so far with muddy courses and many cancellations, it will be exciting to see what the next few weeks of cooler weather and faster races bring!